Drivers thumbing their nose at speed limits may one day get a surprise when the police car springing out to nab them is driverless, if a concept from Ford were to be realized. The automaker filed for a patent for an autonomous police car. The patent filing, spotted by Motor1.com , discussed a car that can spot infractions and act on them. Inventors were listed as Mohamed Ahmad and others. It was filed in July 2016. The applicant for "Autonomous Police Vehicle" was listed as Ford Global Technologies. Presenting the background on their idea, the patent stated, "While autonomous vehicles can and will be programmed to obey traffic laws, a human driver can override that programming to control and operate the vehicle at any time. When a vehicle is under the control of a human driver there is a possibility of violation of traffic laws. Thus, there will still be a need to police traffic." How would driverless police cars know which drivers are breaking rules of the road TechCrunch: "Ford's patent filing describes a machine learning algorithm that would be able to determine whether or not a vehicle breaking the law warrants a warning as opposed to a citation, and relay that decision to the driver." Reports about the filing on tech-watching sites said the vehicle would be equipped to detect speeding or could interact with stationary speed cameras. Sensors on the roadsides could assist the police. The police vehicle could function in the place of human police or in addition to human police. 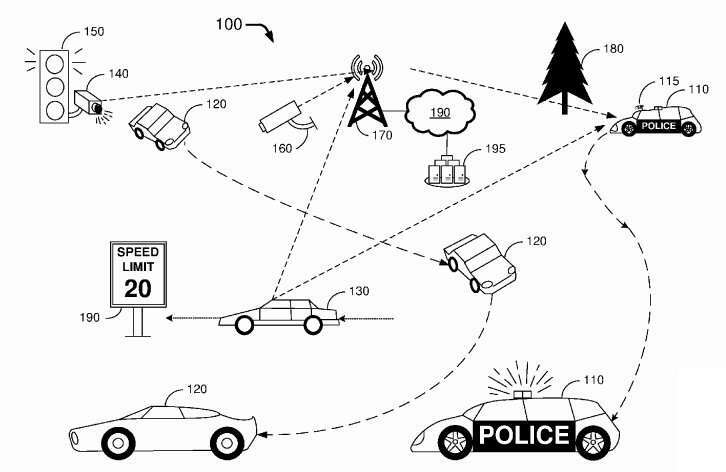 The patent discussion makes the observation that "Routine police tasks, such as issuing tickets for speeding or failure to stop at a stop sign, can be automated so that human police officers can perform tasks that cannot be automated." The patent application in turn described autonomous police vehicles able to perform on behalf of human officers' tasks such as issuing tickets/citations to drivers who violate the traffic laws. The autonomous police car would pursue a speeding vehicle and confirm a speeding violation, in which case the autonomous police car could wirelessly connect to the original car to communicate with the passenger, said TechCrunch, verify identity, and issue a citation. Vaughn Highfield, Alphr, expanded on this scenario, where a police vehicle would interact with a car in question. "In practice, Ford's car would establish a direct wireless connection with a speeding car and then send a message to its dashboard indicating that it's going too fast and has been spotted. The vehicle would then reply to Ford's police car informing it of if it was in autonomous mode or being driven by a human." An offending car's driver would share driving licence information and the police car would automatically file a ticket against the licence. While not all tech observers loved the idea, the patent filing was not very surprising either. Jordan Crook, TechCrunch, said, "it's not outside the realm of possibility that patrol police fall victim to the age of automation." Nonetheless, wrote Stephen Edelstein, The Drive: "The potential pitfalls of machines conducting police work have us feeling especially skeptical about this one." Okay Otto, was this what you had in mind for our Glorious AI Overlords? I cherish the image in my mind. Of your expression when you get pulled over by one of these automat cops. For making the same right turn from the left turn lane onto your street, that you've been doing since 1960. I wonder how long it will take the programmers to write the code for the robot cop shooting someone for committing the crime of 'Driving Black"? What the heck... Automat highway patrol monitoring robot driven vehicles on computerized traffic controlled streets from mechanized garages to automated factories and other computer-run facilities. "For making the same right turn from the left turn lane onto your street, that you've been doing since 1960"
-Why would I do something that stupid? If you're doing that you deserve to be arrested whether by human or robot. Re drone cars I think I would prefer regular drones that would tail car thieves and bank robbers, avoiding dangerous chases. Dear Otto, my man. You miss the irrational reason for police pursuits. It is our hunter instinct to pursue the prey that runs. Terrifying fun and the police get paid for it. So? Whats not to like? Uh the people who often get maimed and killed as a result you moron. Now otto, to paraphrase Benjamin Franklin "Americans are a violent people." and Eldridge Cleaver "Violence is as American as cherry pie." Think of all those people your robots would be putting out of work. Starting with the police and other emergency responders. The news reporters and their flight crews. The guys working the wreckers and the repair shops. Lawyers. Oh My Godtenhimmel! Lawyers! You really want to deprive attorneys of income? You'll probably wind up drawing back a bloody stump. Speaking of LEO's. The guys carrying firearms. Please explain how you intend to convince them that they are redundant to needs in this Glorious AI Utopia of yours. These 'autoCOP's scare me! They would have to be able to use deadly force! They would likely be armed with autoloading medium machine guns among other things. Remember the movie, 'RoboCop'? He really was a human named Murphy who was killed in the line of duty..or so the public, including his wife, was supposed to believe; because his hospital was controlled by corporate criminals who faked his death to get the death certificate in order to exploit him for their experiments. The head of that company personally financially backed a competing idea dubbed '209' that was totally robotic. The point is that Murphy retained his moral center even as RoboCOP, and refused to shoot the innocent; and practiced ethical police work even if his own existence was at issue. The total robot, '209' was a self centered cold blooded killer!! When you subject powerless souls,to soulless power in cold blooded robots; tragedy is inevitable as mathematics. These robots WILL kill! As long as people have civil rights guaranteed by our Constitution, there will be L-I-A-B-I-L-I-T-Y LAWSUITs. Perhaps those worthies at Ford have an agreement with Il Douchebag Adolf 'Pants on Fire' Dumbpf and his Fascisti to stage a Reichstag incident to upend our Constitution. Long before that happens, prudent folks will leave this nation even if one has to over mountains at night naked and with nothing. Look at his poses. He really does resemble Italy's old 'Il Duce', Benito Mussolini..just not as smart. Mussolini actually cared for Italy's poor and is revered to this day in southern Italy and Sicily where he cleaned out the Mafia.